forward with great force. The piston moves forward so quickly that it moves across the chamber gap and its front surface becomes tighdy pressed against the barrel face before the rear part of the projectile has entered the barrel. As the projectile moves through the barrel, the gas pressure acting on the rear of the piston maintains a tight metal-to-metal seal at the face of the barrel and the piston rings prevent the escape of gas around the outside of the sleeve. When the residual pressure in the bore falls to a relatively low value, the forward force on the piston decreases to the point where the cylinder can be rotated to bring the next round into position for firing. The gas piston method of sealing the chamber gap is very simple from the functional viewpoint and does not add greatly to the cost and complexity of the gun. In addition, when it is properly used, it produces a quite effective scaling action. However, like all of the other sealing devices described up to this point, the use of piston seals involves a number of important problems which must be given carcful consideration in design. The scaling action produced by the piston is similar in nature to that produced by the first method described in this analysis. That is, the main sealing action results from a high-pressure metal-to-metal contact between two flat surfaces. When the surfaces are in good condition, accurately aligned, and free of dirt particles, they can bear tightly against each other over a sufficient contact area to efleet an excellent seal. However, if there is any defect which prevents good contact, the sealing action will be imperfect and the consequent leakage of the extremely hot high-velocity powder gases will quickly erode the surfaces. The seal will then quickly deteriorate and soon become useless. Another very serious problem arises from the tremendous force applied to the piston by the peak chamber pressure. As mentioned previously, the peak pressure produced by modem high-powered aircraft cannon ammunition can range anywhere from 45,000 to 65,000 pounds per square inch. In a 30-mm gun, the sealing pistons will have an internal diameter of approximately 1.2 inches and a reasonable wall thickness for the piston is about 0.3 inch. This means that the area exposed to the forward acting pressure of the powder gases will be nearly 1.5 square inches. If it is assumed that the peak chamber pressure is 65,000 pounds per square inch, the force which drives the piston forward will be in the order of 98,000 pounds. Since the piston is relatively light in weight, it will be driven forward with great violence and will strike the barrel face with a very sharp impact. Under these conditions, the rear face of the barrel and the front surface of the piston are subjected to a severe hammering and the entire body of the piston must absorb an intense shock. To add to these difficulties, the temperature of the piston rises rapidly during a burst and may quickly reach the point where it tends to weaken the piston material. All of these factors make it extremely difficult to make effective use of piston seals in rotary action cannons which employ very high-powered ammunition. Even when special alloy steels are used, the pistons tend to break down quickly, either from battering at the sealing surface or from actual crushing of the piston body itself. 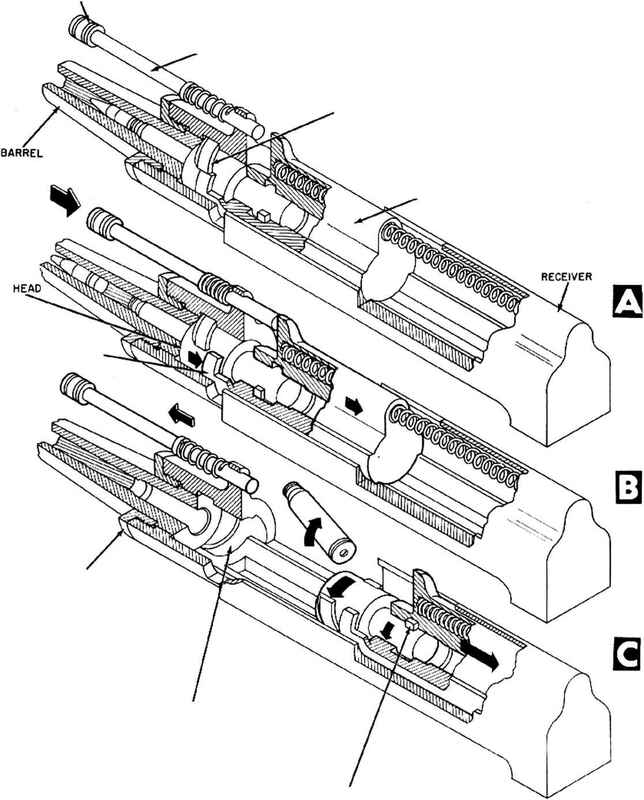 The use of piston seals creates other problems which arc not directly related to the sealing action but do affect the design of the gun itself. One of these problems can be appreciated readily by those familiar with the Williams floating chamber device which is used to cause a .22 caliber cartridge to produce the same recoil as the round used in a .45 caliber automatic pistol. In a revolver weapon, the piston seal produces the same effect of magnifying force, although the presence of the increased force is not evidenced in the same way. The forces resulting from the action of the piston seal and the effect of these forces can be seen in fig. 4-11. If it were not for the presence of the piston seal, the only rearward force produced by the pressure of the powder gases would be the force due to the pressure on a portion of the base area equal to the bore cross-scction area. The rearward pressure on the remainder of the base area is cancelled by an equal and opposite pressure which acts forward on the tapered portion and shoulder of the cartridge case. The effective pressure is transmitted through the base of the cartridge case to the frame of the weapon. The force produced by the pressure creates a tension in the frame and also is the force which causcs the weapon to move in recoil.